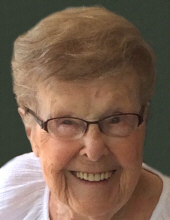 Ruth Charlotte Shea, 96, of Hamden, wife of the late William F. Shea, passed away on November 27, 2018. Born in New Haven on August 5, 1922 to the late Frederick and Anne Blehl Blake. A resident of Hamden for the last 68 years, Ruth loved to garden and was a talented knitter. She was a very independent woman whose main focus in life was her family. Ruth will be remembered by her son, William B. Shea and daughter-in-law Joan of West Haven, daughter, Marlane Hynes of Branford, and son, John T. Shea and daughter-in-law Susan of Fairfield; grandchildren, Will, Allison, Jonathan, and Katelyn Shea, and Kevin Hynes; great-grandchildren, Cooper Shea, Olivia and Parker Hynes, and Sophia Parzych. She was predeceased by her son-in-law, Kevin Hynes, and ten siblings. Friends are invited to visit with her family on Saturday, December 1st from 9:00 to 11:00 a.m. in BEECHER & BENNETT, 2300 Whitney Ave, Hamden followed by her Memorial Service in the funeral home at 11:00 a.m. Burial will be in Beaverdale Memorial Park. To send flowers or a remembrance gift to the family of Ruth C. Shea, please visit our Tribute Store. "Email Address" would like to share the life celebration of Ruth C. Shea. Click on the "link" to go to share a favorite memory or leave a condolence message for the family.